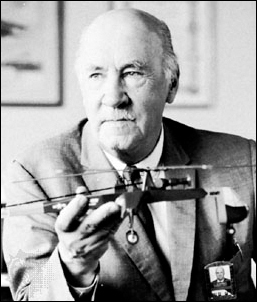 Igor I. Sikorsky (1889-1972) invented America’s first practical helicopter – the VS-300. It was also the first successful helicopter in the world to pioneer the now familiar single main rotor with torque-compensating tail rotor design. This became the standard configuration used by most of the world’s helicopter manufacturers ever since. The development of the VS-300 established the concepts and principles that were utilized in the design of the VS-316 (Sikorsky R-4), the first production helicopter. This marked the beginning of the world’s rotorcraft industry. The principal designer of the VS-300 was Igor lvanovich Sikorsky, born May 25, 1889, in the Russian city of Kiev. At the age of twelve, he made a rubber band powered flying model of a helicopter. 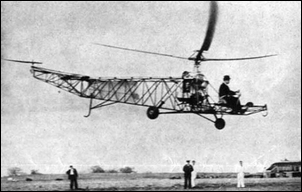 Seven years later, he began experimental study of rotorcraft principles and by July, 1909, had completed the design and construction of a 25 hp Anzani-powered coaxial rotor helicopter. A second one was completed in February, 1910. Although both of these helicopters exhibited the ability to produce lift, it was evident that much further effort and expense would be required to develop such a machine to the point that it could lift off with a pilot aboard. Consequently, Igor Sikorsky decided upon a career of developing fixed-wing aircraft. 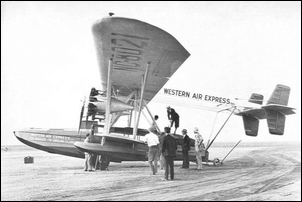 This career eventually included designing the world’s first four-engined airplane (the “Grand Baltic” of 1913) in Russia and the large flying boat airliners of the 1930’s and early 1940’s in the United States. Mr. Sikorsky, however, never abandoned his dream of building a helicopter and resumed development work in 1928. The lighter materials and improved aviation engines then available allowed him to conclude that a successful, practical helicopter would soon become possible. He submitted a patent application in 1931 for a helicopter design that was similar to, and included nearly all the major features of, the VS-300. The patent was granted in 1935. Prior to this time, a number of experimental helicopters appeared (along with other categories of rotorcraft such as autogyros and gyroplanes). However, none of these exhibited all of the characteristics that are expected in a helicopter: stability, control, speed, auto-rotational landing and lack of excessive vibration. 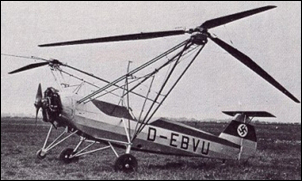 The first successful helicopter to fly in Europe (and probably in the world) was the French Breguet-Dorand “Gyroplane Laboratore” of 1935 which had a dual coaxial main rotor. 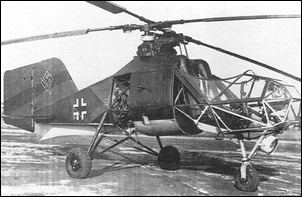 Two side-by-side main rotors mounted on outriggers were used for the Focke-Achgelis Fw-61 which was initially flown in Germany in 1936 and is considered to be the world’s first practical helicopter. Another German helicopter, the Flettner synchrocopter was produced for military use between 1942 and 1945. This aircraft, sometimes referred to as an “eggbeater” type, had its twin main rotors mounted on skewed shafts and required its rotating blades to synchronize with one another. In 1938, Igor Sikorsky’s proposal to develop a helicopter to test his theories was accepted by United Aircraft, parent corporation of Sikorsky Aircraft since 1929. The VS-300 was designed in the spring of 1939 and built that summer. On September 14, 1939, Igor Sikorsky piloted the first test flight of the VS-300 from the property of the Vought-Sikorsky plant in Stratford, Connecticut. Over the next several years, the aircraft demonstrated its practicality and served as an experimental prototype. 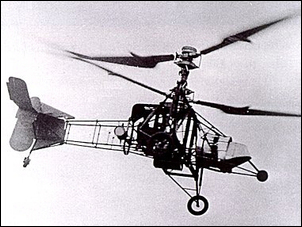 It was the first successful helicopter in the world to have a single main rotor. Late in 1938, lgor Sikorsky won approval from United Aircraft to develop a research helicopter. 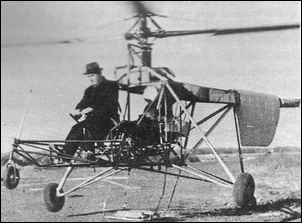 On March 12, 1939, he submitted a proposal which described a single-rotor helicopter, powered by a 75 hp piston engine and estimated at a cost of $60,000 to design, construct and demonstrate a successful helicopter with satisfactory control characteristics. Construction of the Vought-Sikorsky-300 VS-300 began in late March of 1939. This first configuration had a three-bladed main rotor, 28 feet in diameter, and was powered by a four cylinder, air-cooled, 75 hp Lycoming engine. Its fuselage was an open framework of welded steel tubing with controls and an open pilot’s seat. The power transmission consisted of V-belts and bevel gears. The anti-torque tail rotor was single-bladed and 40 inches in radius. On September 14,1939. Mr. Sikorsky piloted the first flight of the VS-300 from the property of the Vought-Sikorsky plant in Stratford, Connecticut. The duration of the flight was approximately ten seconds and the altitude attained was a few inches. By November of 1939, sustained flights were being made, but the control and stability characteristics of the aircraft were described as being marginal. The helicopter sustained severe damage on December 19, 1939, rolling over on the ground after being caught in a gust of wind while hovering. It was believed that control was the basic problem here, and a different tail rotor concept was explored in the VS-300’s second configuration. The first tethered flight of the VS-300 in its second configuration was made on March 6, 1940. Roll and pitch control were provided by adding two lifting (horizontal) tail rotors which had differential collective pitch. Each rotor was 40 inches in radius. The azimuth control was removed from the main rotor, leaving only collective pitch control. Control of the aircraft was now satisfactory except in forward flight. It was in this configuration that the VS-300 made its first free flight on May 13, 1940, and was publicly demonstrated for the first time on May 20, 1940. By July, a 90 hp Franklin engine was installed and experimental development of the aircraft progressed into the following year. 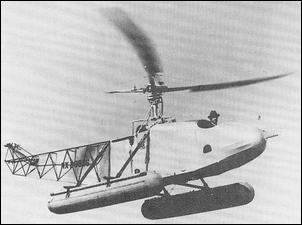 After the attachment of rubber pontoons, the VS-300 made the world’s first helicopter water landings on April 17, 1941. On May 6, Igor Sikorsky piloted the VS-300 to establish the International Helicopter Endurance record of 1 hour, 32 minutes and 26 seconds. By mid-August of 1941, the VS-300 had been altered into its third major configuration. Longitudinal control was provided by a single lifting tail rotor. Lateral control was achieved by restoring cyclic pitch to the main rotor through a swashplate. Both the lifting and the anti-torque rotors were two-bladed and 46 inches in radius at this time. Eventually, a three-bladed lifting tail rotor was installed. This configuration was believed to have given the best control characteristics to the VS-300. Fabric covering of the fuselage frame was first experimented with at this time and found to offer favourable effects. Since the principles of good control ware then understood, the fourth and final configuration of the VS-300 was established in order to achieve a simpler aircraft. The horizontal tail rotor was removed and full cyclic pitch control given to the main rotor. The first flight in this configuration was made on December 8, 1941. Various design options intended for future application to production helicopters were experimented with in the VS-300 during the following two years. By September of 1943, the final version of the aircraft had achieved speeds of up to 80 mph. On October 7, 1943, Igor Sikorsky presented the VS-300 to Henry Ford at the Edison Museum in Dearborn, Michigan. It had logged a total flight time of 102 hours, 34 minutes and 51 seconds. *The Sikorsky VS-300 is an American Society of Mechanical Engineers (ASME) International Historic Engineering Landmark. The text of this story appears by agreement of the ASME. Go to http://www.asme.org/Communities/History/Landmarks/Sikorsky_VS300_Helicopter.cfm for more on this Landmark.